When I discover something new I usually use it frequently at first, so I can get familiar with it and have a better sense of what I can do with it. If I just use it once, chances are I will be just as reluctant to use it the next time it comes up as I was the first time. And so it has gone with fennel. Fennel has intrigued me for many years, but every time I saw it at the grocery store and considered bringing it home, I just couldn't picture preparing it. What do you do with the stems, not to mention the fronds? How exactly do you cut the bulb, and how do you cook it after it is cut? It seems strange to be intimidated by a vegetable, but there you have it. We all have our food fears. Half the fun of being in the kitchen for me these days is overcoming those unexplainable little fears and cooking up a mess of something strange, wondrous and new. 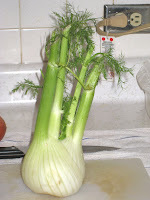 Once I had bought my first fennel bulb, I took it home and cut off the stalks. I wasn't entirely sure what I wanted to do with them, but I did not want to just throw them away. I put them in a plastic bag and threw them into the produce drawer of the refrigerator. I had some chicken bones in the freezer and I thought I could use the fennel stalks the next time I made stock. Then I sliced the bulb in half. You can see how it grows, with the layers coming out of the triangular core there at the bottom. What I did not know the first time I used it was that the core is really tough. You would think it would have occurred to me because you cut the core out of every other vegetable, but I wasn't really thinking. 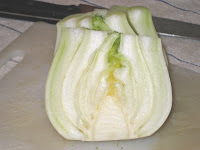 And that little bit of core at the bottom of every piece of fennel was tough and not tasty at all. And as usually happens when you try something new, that same week on her Food Network show "Barefoot Contessa Back To Basics" Ina Garten prepared a fennel bulb. The first thing she did after cutting the bulb in half was to cut out the core. So I did the same the next time I used it and it made all the difference in the world. The next time I bought a fennel bulb was for the pot roast, which was a big success. I now had two sets of stalks and I was pretty sure I didn't want to put that much in my chicken stock. But I did have those two beautiful beef shanks with which I planned to make Vegetable Beef Soup. I used the stalks from the first bulb first and sliced them up about the same size as the carrots. Their flavor is stronger than the bulb so I really just wanted to capture the flavor, so using them for the braising seemed perfect. And that was one delicious beef soup, if I do say so myself. 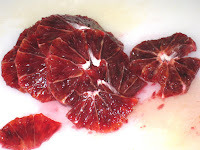 After reading misreall's comment about how good blood oranges are right now, they caught my eye the next time I was at the grocery store so I brought a couple home with me. I know orange and fennel is a common flavor combination, so when I was getting ready to bake another chicken, I thought it might be good to combine the blood orange and the fennel. I cut the peel away from the orange and thinly sliced it instead of segmenting it. I pushed the slices between the skin and the pieces of the cut-up chicken before seasoning it and putting it into the oven. I layered the chicken over onions, carrots, garlic and the fennel that had been seasoned with salt, pepper, thyme and marjoram and then covered with a couple of tablespoons of olive oil. The juice from the orange had permeated into the meat, but it did leave the remaining segments somewhat dry, and surprisingly bitter. I would either just use the juice next time, or remove the remaining pulp before serving. I thought couscous would make a nice accompaniment to the chicken, so I cooked up a batch in some chicken stock I had in the freezer. I combined it with the roasted vegetables. Once I got it on the plate, though, it looked kind of bland and monochromatic, so I diced a roasted red pepper to throw over the whole thing. 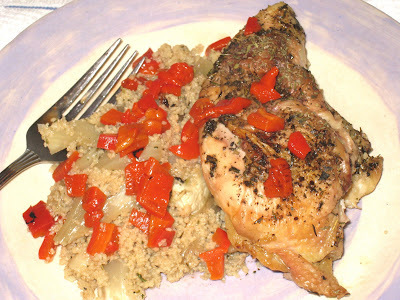 Not only did it look much better, the peppers added a lovely zing of flavor. I followed my usual method for baking the chicken. You can find a good description here, just use onions, garlic, and fennel. Add carrots and celery if you want - I would have if there had been any in my vegetable bin and then maybe there would have been more color. I used salt, pepper, thyme and marjoram for seasoning. For the couscous, I basically followed the package directions and then combined them with the vegetables. I used a jarred roasted red pepper. This is an easy dish and it works really well on a cold winter night.